When am I not wearing pink!? Pretty much anything pink you can be sure you will find in my closet. 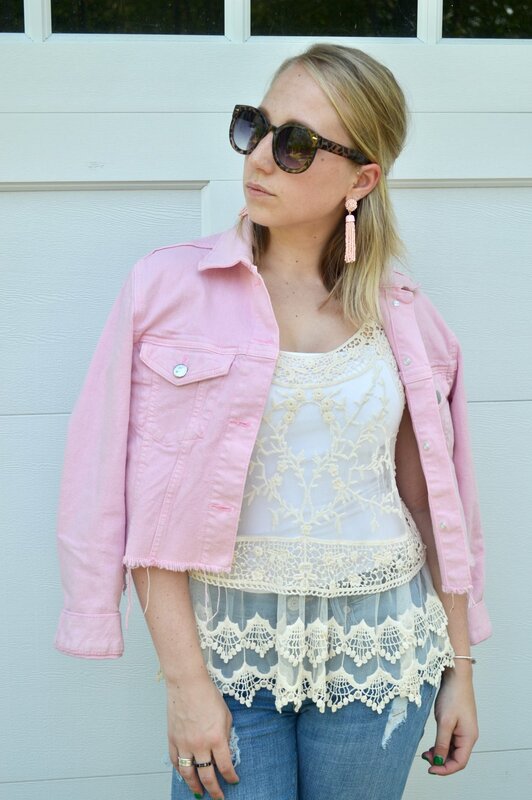 Today I'm sharing just a few of my pink beauties, a pink, cropped, jean jacket and adorable pink tassel earrings, both of which are relatively new to my wardrobe. I've had a few people stop and ask me if I cut my jacket myself and the answer to that is, nope! Just as you see it is how I purchased it! I love a good purchase that looks DIY. And I'm so excited to share my latest accessory find with y'all! 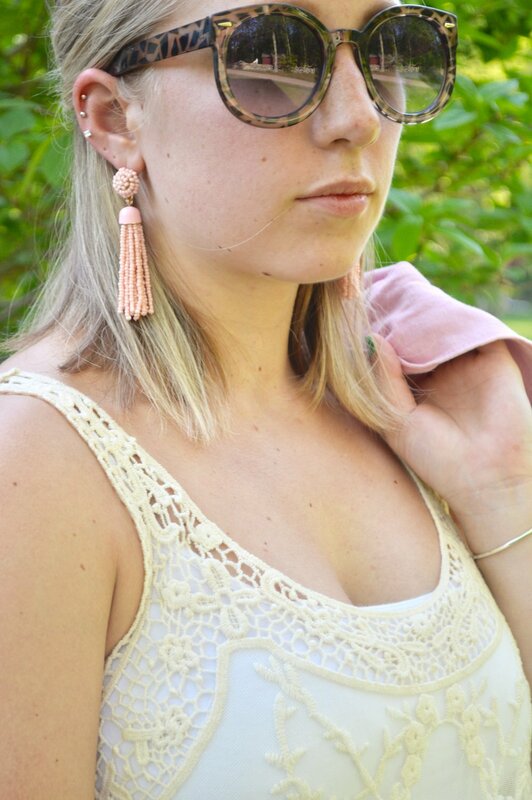 My pink tassel earrings are from my favorite local shop Grace, and I am in love with them! I had been wanting a pair of tassel earrings for a while now and has been holding out, but when I stopped into Grace and these little guys were at my finger tips I couldn't resist any longer, I snatched them up along with another pair of earrings which will be coming to the blog soon! This is a relatively casual and comfortable look. I threw this on to get dinner with my family and it was perfect for just grabbing a quick bite to eat. Espadrilles sneakers need to be the next craze though because let me tell you, so cute, so stylish, SO comfortable! They are the whole package. With a coupon my mom found for DSW these babies were only about 30 dollars! 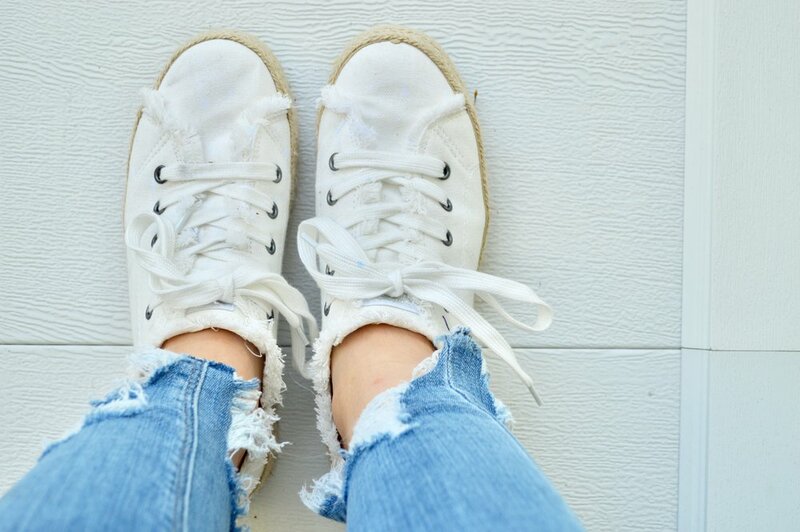 Sneaks like these are perfect travel shoes for destinations where you'll be doing lots of walking but aren't trying to compromise a cute outfit with athletic sneakers or they are simply good for just making an outfit cute and casual if you aren't looking to get too dressy. Try this look out for your next casual outting.